This time of year is beautiful on Edisto Beach and nobody enjoys it more than the dogs. After October 31st, dogs are allowed to be back on the beach without a leash. 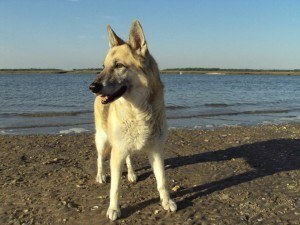 Granted, owners are still required to have the dog under vocal command, so if your dog doesn’t know sit and stay  or the ever-important command of “leave it,” which is especially useful when canines come upon malodorous and washed up items on the beach  then make sure you still use your leash. Edisto is extra-special, too, because it’s one of the only beaches that allows off-leash fun for dogs. However, that doesn’t mean there aren’t a few rules to abide by. For instance, the dunes and sea oats are off limits to humans, so they’re most definitely off limits to dogs. This rule is to protect the dunes and the natural beauty of the beach, not to squelch your dog’s happy fun times. As a dog owner, I’ve had to get my 80-pounder out of the sea oats a million times, so if your dog does scamper up the beach and get into them, just make sure you get him or her out of there. Watch out for the sand burrs located in that area as well as they can be painful when caught between a dog’s paws. Dog owners are also required to pick up after their dogs. Each beach access comes equipped with doggy bags so that there is no excuse for any mess to be left behind. Dogs must also be kept away from Loggerhead nesting areas. Naturally, these areas are always intriguing to dogs, so don’t be surprised if your pet tries to drag you to a nest for a sniff-fest. It’s a good rule of thumb to keep your leash handy should the beach prove to be too exciting for your pet. Plus, you don’t want your dog to run up to someone else and steal something out of their cooler like mine has done before. Most areas of the beach are safe for dogs, but sometimes, due to erosion, there can be unexpected drop offs that could trip up you or your dog. Some areas of beach down around the sound can also get particularly muddy, so you’ll want to watch out for that. No matter what part of the beach you visit, it’s pretty much guaranteed that you and your dog will have a great time.